We joined Jon Baines Tours on their dental study trip to Peru, a country as varied in culture as in natural landscape. Journey from Lima, the modern capital through the Andes to Cuzco and the legendary lost city of Machu Picchu the home of the Incas. 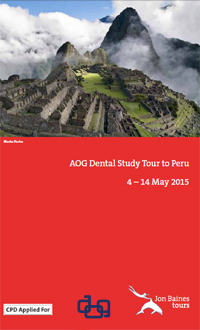 We saw where both the Inca and Spanish empires left their legacy in Peru on this bespoke tour designed for the AOG. The rich cultural programme was punctuated with professional visits and lectures giving an insight into dental practices throughout the country. CPD points were available due to the professional nature of the tour. The hotels on the tour were all centrally located 4 star properties which offer comfort and spacious rooms. The tour started on the 4th May in Lima and ended in Lima on 14th May.